A herb used in traditional Indian medicine shows promise in reducing the laminitis risk for ponies with hyperinsulinemia, a condition in which too much insulin is produced in response to glucose. 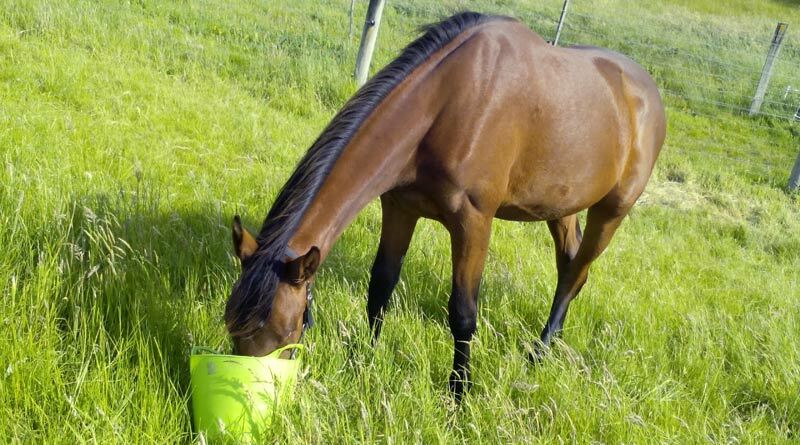 Hyperinsulinemia is a major risk factor for laminitis. Melody Anne de Laat and her colleagues, writing in the open-access journal PLOS ONE, noted that sweet taste receptor inhibitors, known as T1R2/3 inhibitors, have been used to reduce the insulin and glucose responses to oral carbohydrates in other species, but not horses. The study team in Queensland, Australia, said it would be useful to be able to reduce the large insulin response that typically occurs after a carbohydrate-rich meal is fed to insulin-dysregulated horses. They set out to test the effectiveness of two inhibitors, lactisole and Gymnema sylvestre, for reducing glucose uptake by the equine small intestine, both in a laboratory setting and in live ponies. Lactisole is carboxylic acid salt which largely suppresses the ability to perceive sweet tastes. G. sylvestre, sometimes called Australian cowplant, is used in traditional Indian medicine used for supporting balanced blood sugar levels and is known to dull the palate to the taste of sweets. In the first phase, the glucose uptake of sections of the small intestine from four horses euthanized for reasons other than the study were tested in a laboratory in the presence of each substance, and without. Lactisole reduced glucose uptake by 63% and G. sylvestre by 73% when compared to the control samples. Eight mixed-breed ponies were used for the live experiment, seven of whom were overweight, but otherwise healthy. Each underwent an oral glucose test to examine their base and post-meal serum insulin and blood glucose concentrations. Two separate dose response studies were performed to assess the effectiveness of lactisole and G. sylvestre at three different doses, all of which were tolerated well by all the ponies. Their diet included wheat bran soaked in a solution of glucose and water. The addition of lactisole to the glucose-containing test diet had no effect on glucose and insulin concentrations following the carbohydrate-rich meals, they reported. G. sylvestre was partially effective at reducing post-meal blood glucose (by around 10%) and serum insulin concentrations (around 25%) in seven of the ponies, with a most effective dose of 10 mg/kg bodyweight. However, the G. sylvestre failed to cause any apparent difference in the maximum glucose concentrations, but the compound did appear to cause a dose-dependent decrease in the maximum insulin level, although this decline was not statistically significant at any individual dose rate due to the large degree of variation in response between ponies. The results suggested that T1R2/3 inhibitors may be a useful therapeutic strategy for the management of equine insulin dysregulation and the prevention of laminitis, they said. Discussing the study findings, the researchers noted that lactisole was highly effective in a laboratory setting, but not in the live ponies. “It is possible that the lactisole doses selected for this study may have been insufficient, but considering the wide dose range used, and the efficacy of these doses in other species, other reasons should be explored. “It is possible,” they said, “that the oral bioavailability of lactisole is poor in horses. G. sylvestre, on the other hand, while not effective in all the ponies, appeared to have some effect in the majority of the animals tested. However, again, the laboratory results were much better. There were many factors that could have contributed to the variability of results in the live horses and in the laboratory setting. “In conclusion, the current study has provided foundation data for a novel therapeutic strategy for equine insulin dysregulation,” they concluded. The findings could be used as a baseline for the design and planning of further research that will investigate the safety, efficacy and feasibility of this approach to managing equine insulin dysregulation. The study team comprised de Laat , Murad Kheder and Martin Sillence, all from the Queensland University of Technology; and Chris Pollitt, from the University of Queensland.